Cop, at window: "Were you just taking pictures of headquarters?" Me, surprised: "Huh? No, I didn't even realize they were there...I was taking a picture of the sign. 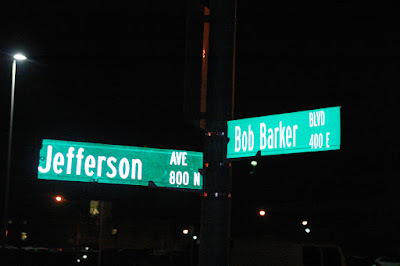 Bob Barker...thought it was funny. Here, I'll show you..."
Cop, looking at pictures on camera: "Hmmm...you're not from around here, are you?" Me, explaining all the kids in spandex he's undoubtedly seeing: "No. I was at a wrestling tournament. I work for a newspaper in Waynesville. Sportswriter." Cop, bemused, handing camera back: "I see...well, you can go, we just wanted to make sure..."
He eyed me all the way back to his patrol car. Stuff like that is why I carry a camera and voice recorder in my car at all times. haha, that's great. (the signs and the story, that is). Econ's link touches on the military restrictions, and it's true. Whenever I visit my dad at work (he works in the STRATCOM building at Offut AFB, NE) the guards at the front door confiscate my cell phone because it has a camera. And any time a civilian walks into a room, everyone turns off their monitors, just in case you have a hidden camera, a la "Mission: Impossible." Yeah, I figured as much, only I wasn't fixing to get into a high-speed police chase in downtown Springfield, so I pulled over just top be safe. So moral of the story: We tend to think cops are every bit as suspicious as they think we are. Why can't we be friends?"